Swivel fiber glass seat and aluminum base chair, designed in the late 1960s by Yrjö Kukkapuro for Haimi. These chairs are no longer in production, there are no re-editions nor copies. Chairs have no structural issues, no cracks on fiber or aluminum. Chairs have been repainted once and the shells show few spots of missing paint and the bases have few scratches. A pair of perforated chromed steel chairs designed by Niels Jorgen Haugesen in the 1970s and produced by Italian manufacturer Magis. 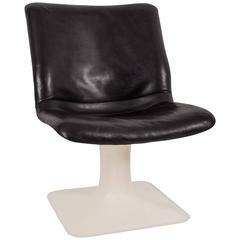 Yrjo Kukkapuro swivel side or desk chair in black molded plastic with newly upholstered wine colored leather cushion. Made in Finland by Haimi. Pair of Yrjo Kukkapuro swivel side or desk chairs in black molded plastic with newly upholstered wine colored leather cushion. 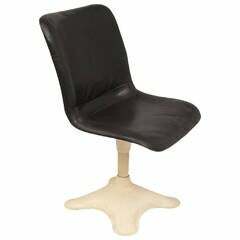 Made in Finland by Haimi. .
Black leather upholstered seat. White and metal swivel base. By Yrjo Kukkapuro. 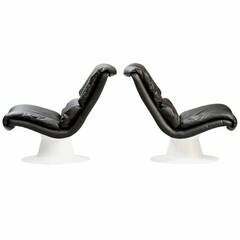 A pair of easy chairs, “Saturn” model with moulded synthetic shell re-upholstered in black leather, white lacquered fiberglass foot. Producer: Haimi. Rare pair of easy chairs model 418 designed by Yrjö Kukkapuro. Produced by Haimi in Finland.